In the latest installment of our “Points and Miles Destination Guide” series, TPG Contributor Whitney Magnuson explores the many different ways to maximize hotel redemptions in Miami using points and miles. Miami is one of the most vibrant cities in the country — a melting pot of different cultures, cuisines, art, music and nightlife. The city attracts nearly 15 million visitors each year and has a plethora of drool-worthy hotel properties for all kinds of travelers and budgets. Below, I’ll look at five common reasons for booking a hotel in Miami and recommend redemptions that best maximize point and mile options. The pool at the W South Beach. Image courtesy of the hotel. Hot bodies, Art Deco architecture and great nightlife all bring the crowds to Miami’s South Beach district, which can be found just off the coast of mainland Miami between Biscayne Bay and the Atlantic Ocean. 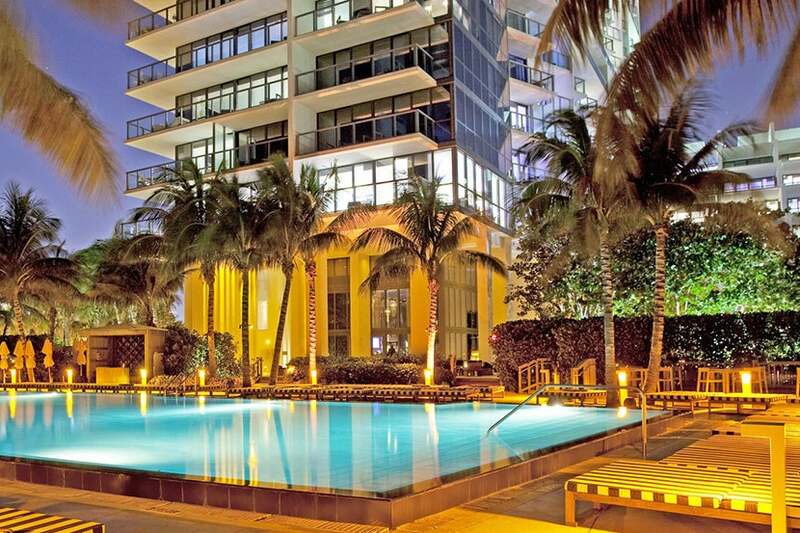 For those looking to be in the center of all the excitement, the W South Beach is a solid choice. Featuring ocean views and a popular pool, this property is definitely on the pricey side — its lowest nightly rates start at about $782 per night. However, if you use Starpoints, a room can be had for 30,000 points per night, giving you a redemption rate of about 2.6 cents per point redemption rate, which is favorable according to TPG’s latest monthly valuations that peg Starpoints at 2.5 cents apiece. And with the Starwood Preferred Guest Credit Card from American Express offering 25,000 bonus Starwood points after spending $3,000 in the first three months, a cardholder is already most of the way to a free night after just completing the introductory spending. The Holiday Inn Port of Miami. Image courtesy of the hotel. With more than 30 cruise ships calling the Port of Miami home for at least a portion of the year, it’s no surprise that many visitors come to the city just before setting sail. And as seasoned cruise-goers typically recommend arriving in your embarkation city the day before your ship is scheduled to depart, many of them will need at least one night in a hotel. 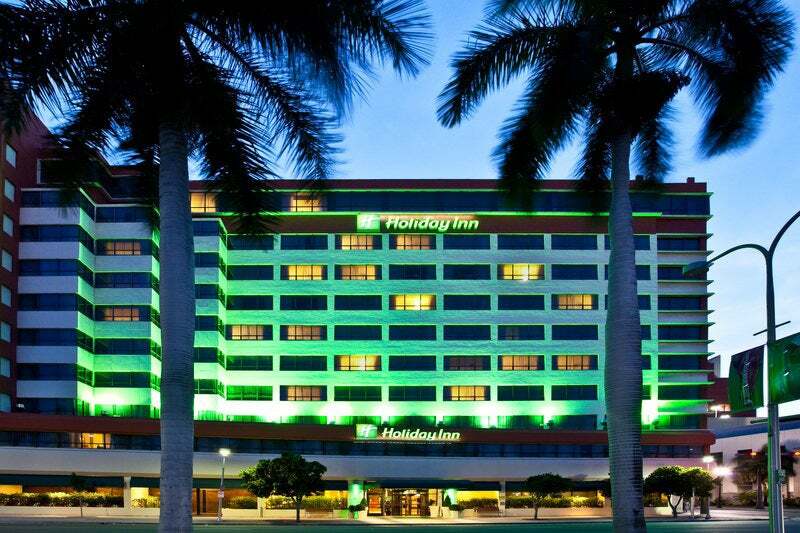 The closest hotel to the Port of Miami is the Holiday Inn Port of Miami, which averages $285 or 35,000 IHG points per night, for an effective redemption rate of 0.8 cents per point. Given the current 60,000-point bonus available after spending $1,000 in the first three months with the IHG Rewards Club Select Credit Card, earning a free night in advance of your cruise vacation is very doable. The Hyatt Regency Miami is located right next to the Miami Convention Center. Image courtesy of the hotel. The James L Knight Center, located in Downtown Miami, pulls double duty as both an entertainment arena and the home of the Miami Convention Center. Note that this is a different convention center than the Miami Beach Convention Center, which serves as a focal point of the annual Art Basel event. 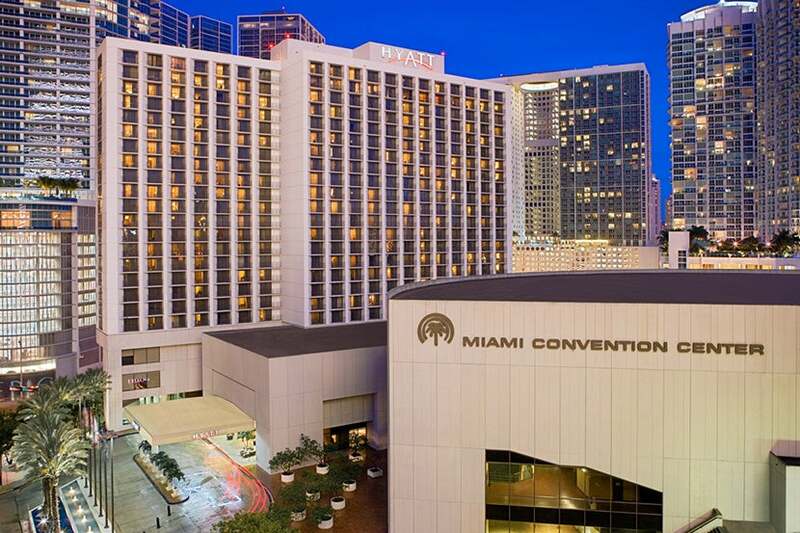 Assuming you’re visiting the former, you’ll most likely want to stay at the Hyatt Regency Miami, which is connected to the event space and offers additional overflow meeting areas for larger conventions. Rates for a standard room tend to hover around $270 a night, or can be had for just 12,000 Hyatt points. As Chase Ultimate Reward points transfer instantly to Hyatt, a traveler looking to book a points stay at this property would do well to consider the Chase Sapphire Preferred. The card currently offers a 50,000-point bonus after spending $4,000 in the first three months after card opening, which would be enough for a free four-night stay. The Hyatt House Miami Airport. Image courtesy of the hotel. Miami is a true international destination, with nonstop flights out of the Miami International Airport to nearly all the major South American and Latin American cities, as well as many destinations in Europe and the Middle East. When an early morning flight or a travel snafu means needing a hotel room near the airport, you’ll often find a great redemption value at the Hyatt House Miami Airport. The Hyatt House is an all-suite hotel, and it offers a complimentary airport shuttle for hotel guests, a full breakfast buffet and free high-speed internet for about $329 a night. However, for only 12,000 Hyatt points per night, the same room would give you a very good redemption value of 2.7 cents per point. Further, because this is an all-suite hotel, that standard award gets you a two-room suite without the need for a suite upgrade certificate. The Aloft Miami – Brickell. Image courtesy of the hotel. Whether Pitbull’s inspired you to check out the Calle Ocho, or you’ve always wanted to dine at famed Cuban restaurant Versailles, it’s undeniable that Little Havana is an integral part of Miami’s cultural draw. Unfortunately, the neighborhood is not particularly flush with hotel options. Instead, anyone hoping to explore this district should consider a stay in the Brickell neighborhood, just east of Little Havana. 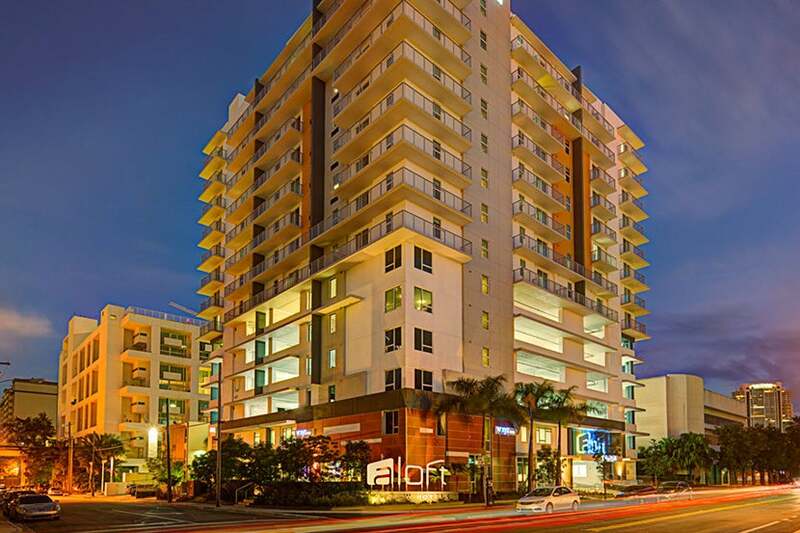 The Aloft – Miami Brickell, for example, is less than two miles away. Even better, with a Citi Bike station just outside the hotel, the Cubano-curious can easily rent a bike and then explore the district on two wheels; Maximo Gomex Park, aka “Domino Park” is less than a 10 minute bike ride away. A standard room at the Aloft tends to run about $218 a night, or can be redeemed with 10,000 Starpoints, meaning a redemption value of about 2.2 cents per point. However, some dates are available with an even more attractive cash + points option, where each night costs $75 plus 5,000 Starpoints. That redemption bumps the value of your points up to 2.9 cents per point — well above the latest TPG valuation. What’s your favorite points hotel in Miami? Let us know in the comments, below.